What ended up becoming the subject of what I consider an interesting blog post, came as the result of a wrong turn. 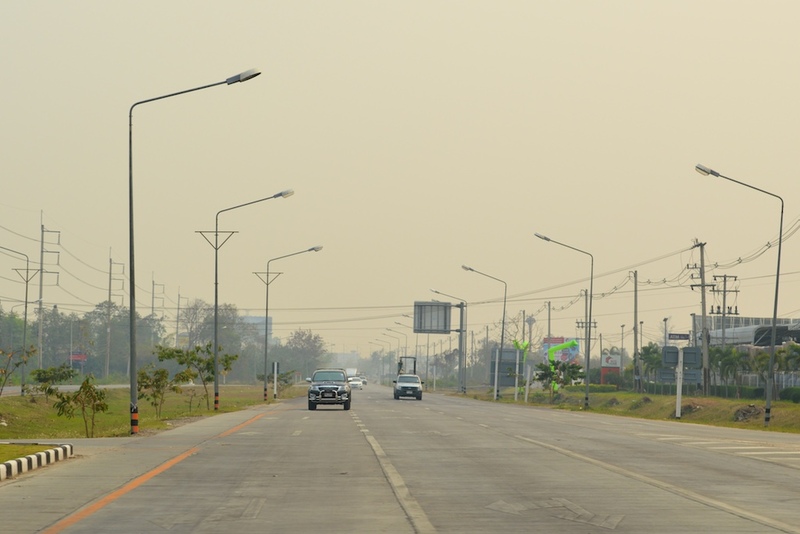 While the wife and I were coming back from our final day of sightseeing around Chiang Mai, our driver missed the turn onto the “expressway” and instead drove us down what I would later find out was the old Chiang Mai-Lamphun Road. Once on the road you notice something different right away. Had I known this road existed I would have planned a sightseeing visit prior. This photo op would be short-lived, as I had a wife tired from a long day of sightseeing who just wanted to get back to the hotel for a massage. We were in Thailand, after all. I am a sucker for old, stately trees. While doing online research I found some great photos of spots along the road that I didn’t get the opportunity to see. Most disappointing was missing the extremely narrow stretch that has trees that are blessed with orange cloth (more on that later) and are protected by a conservation society. Still glad I got the chance to see a few kilometers of the remaining 10 kilometers of old road these massive trees border. 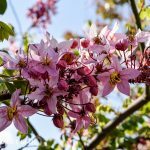 Historians differ as to the exact date, but most would agree that the trees were planted around 1882. Dipterocarpus alatus being a massive shade tree gives rise to the belief that the trees were planted to provide shade for soldiers, elephants and royalty traveling the road between Chiang Mai and Lamphun, allowing them to walk sheltered from the hot tropical sun. Our guide (photobombing in the picture below) told me that it has been proposed a few times that they cut down many of the trees to widen parts of the road. 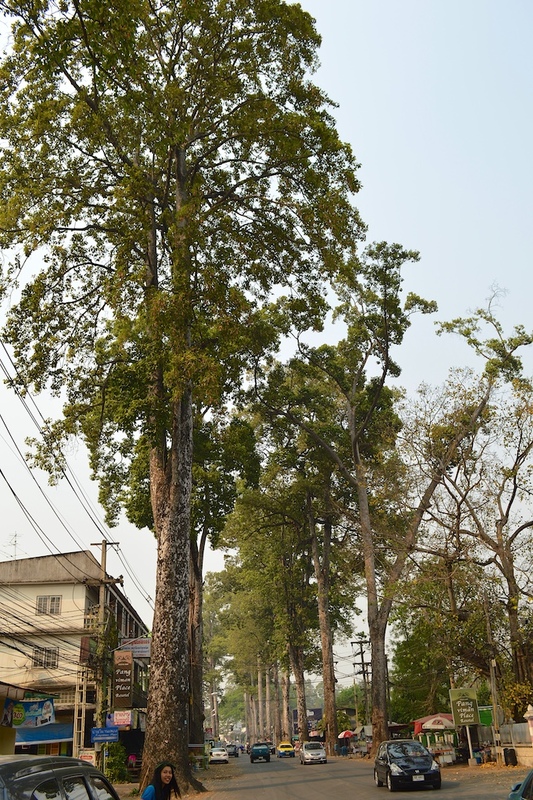 Apparently the King of Thailand wasn’t pleased with the proposals and has sought to ensure that the remaining 936 Yaang Naa Trees still alive on Chiang Mai-Lamphun Road are protected. 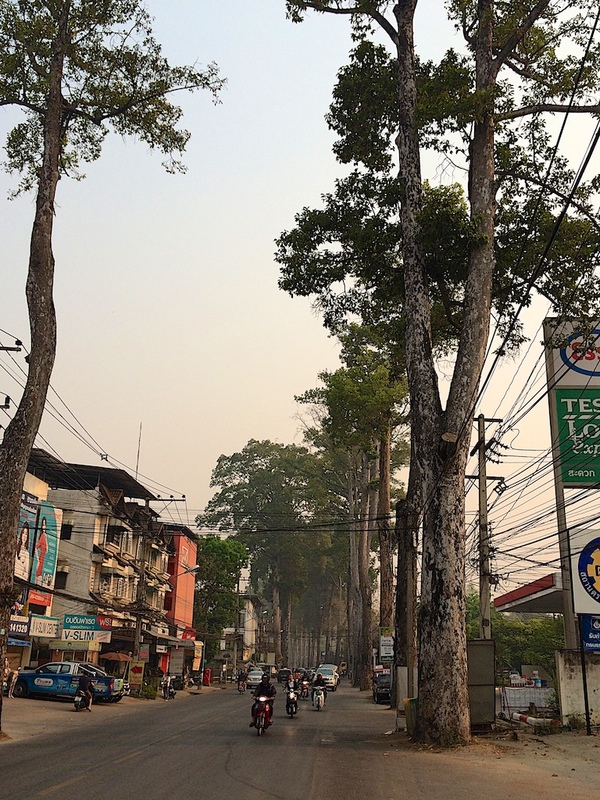 However, Chiang Mai is exploding in growth and I have personally witnessed what happens to old trees here in La Costa that got in the way of development, so who knows how many of the trees will make it through Chiang Mai’s growth. 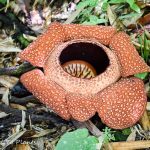 There is one thing to point out about the common name of Dipterocarpus alatus. 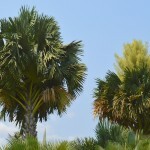 Thai people always like to shorten names, so the common name of the tree “Yaang Naa” eventually became “Yaang.” “Yaang” is the name for the Rubber Wood or Para Rubber Trees (Hevea brasilliensis), which were imported from South America to Thailand. So most of the locals incorrectly call these trees “Rubber Trees”—which they of course are not. 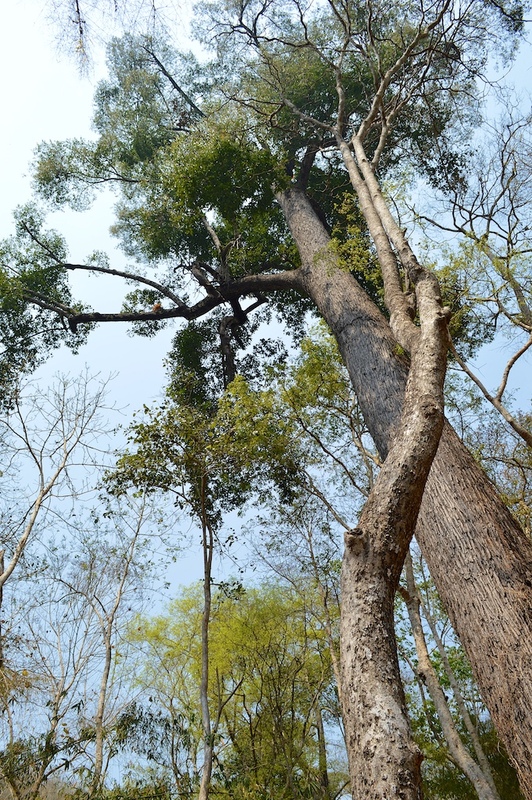 Lucky for Dipterocarpus, Yaang Naa trees were never as popular as another Thai forest staple: Tectona grandis (Teakwood). The main reason being that Dipterocarpus is not as hard of a wood as Teakwood, nor as attractive. So it wasn’t used in things like furniture or ship building to the same degree as Teakwood. 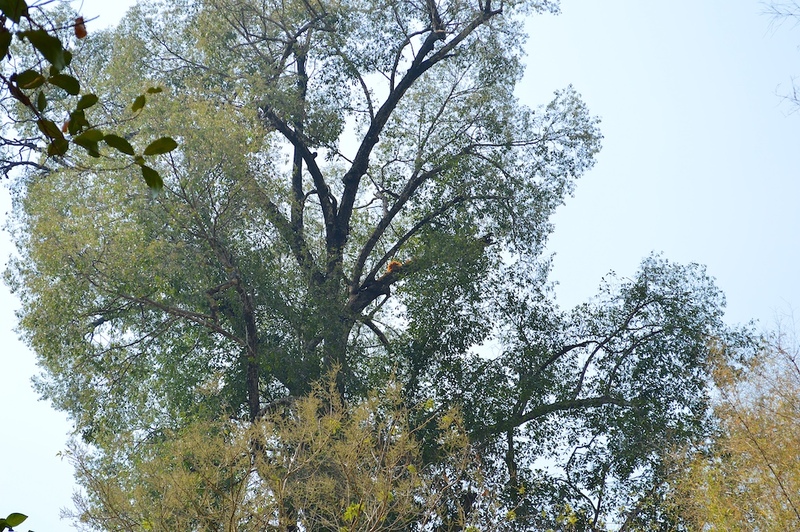 Dipterocarpus is more popularly used to produce latex and resin. The resin is then used in the manufacture of paints and coatings. 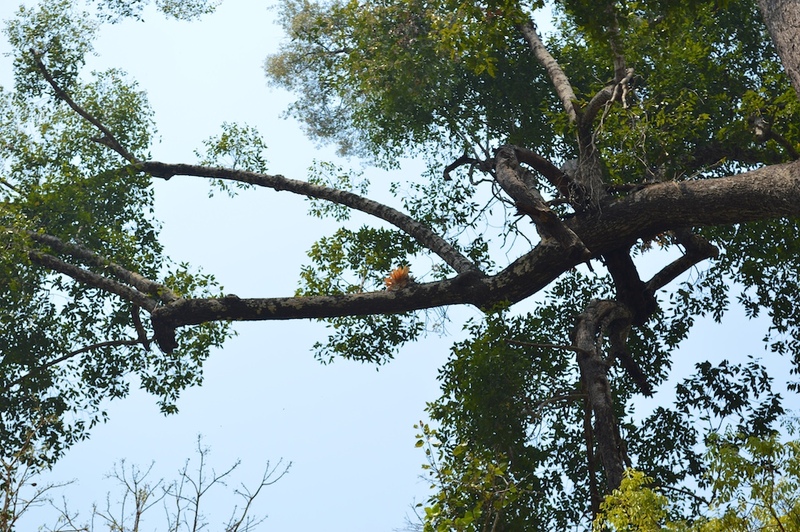 So while it is almost impossible to find old Teaks in a Thai forest, you can find some large Dipterocarpus. 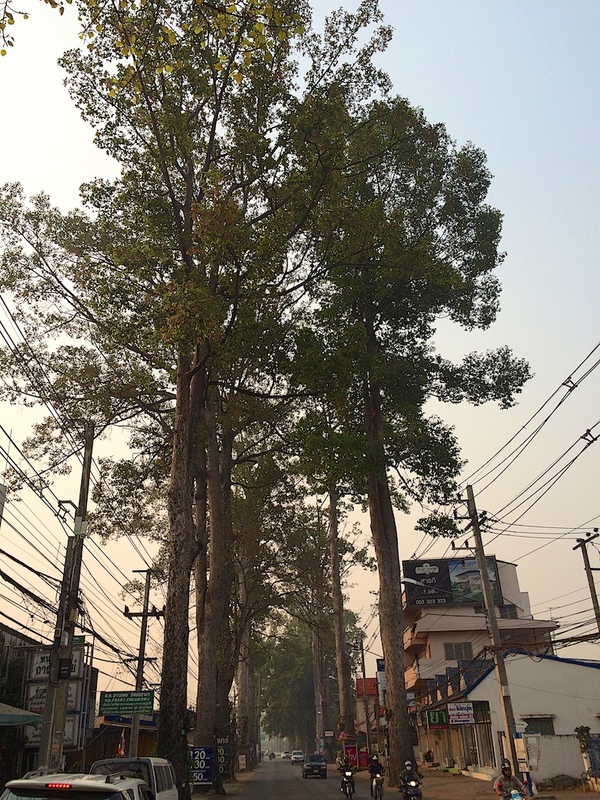 The trees along the Chiang Mai-Lamphun Road are actually not uniquely large. 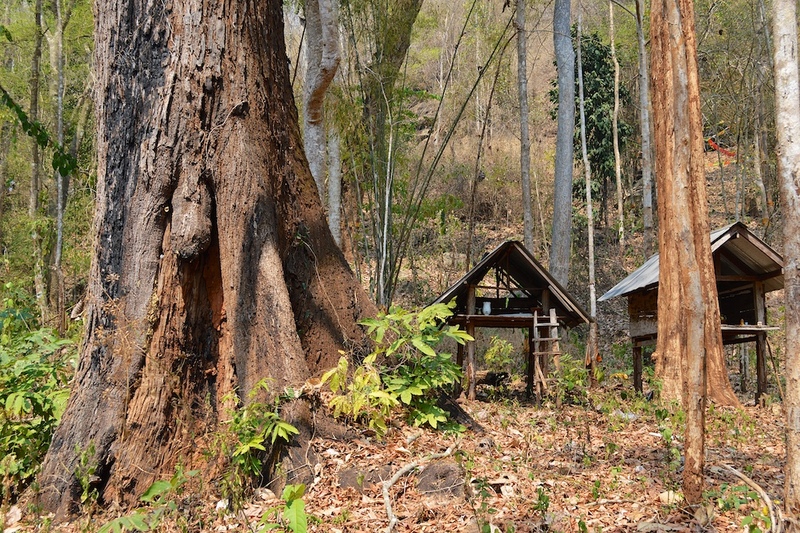 Much larger, older trees can be found protected throughout Thailand. 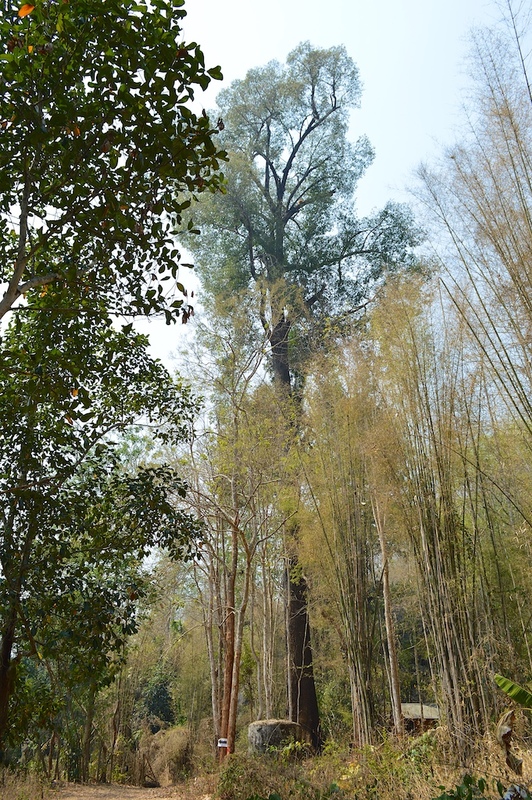 I read that Dipterocarpus alatus can grow to more than 50 meters tall and have a circumference of more than 14 meters. During a two-hour nature walk to a waterfall early that day, we ran across a few larger examples of the genus. For accuracy, because Dipterocarpus alatus is quite rare in forest, I am pretty certain this tree below is actually either a Dipterocarpus obtusifolius or Dipterocarpus tuberculatu. Did you notice the epiphytes growing in that tree? It looked to be some species of Bromeliad. Like many other tribal villages around Chiang Mai, one of the villages we hiked through still had a site with a protected tree. In most cases the tree is so revered that the locals place prayer houses next to it. Just as they did with the monster photographed here. 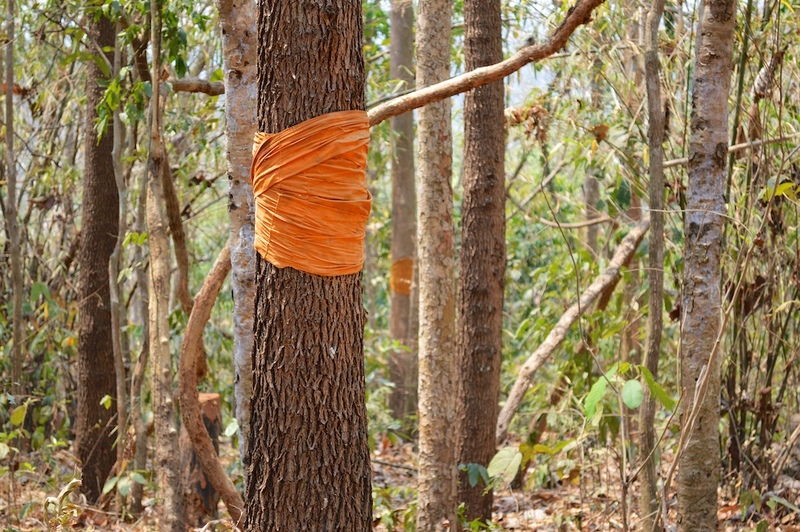 I mentioned earlier that many trees along the Chiang Mai-Lamphun Road were blessed with orange cloth from Buddhist Monks. While I did not get the opportunity to see that stretch of road, we did find this being done in the forest we hiked in around Chiang Mai. I asked our guide what the importance of this was and she stated it was for conservation. 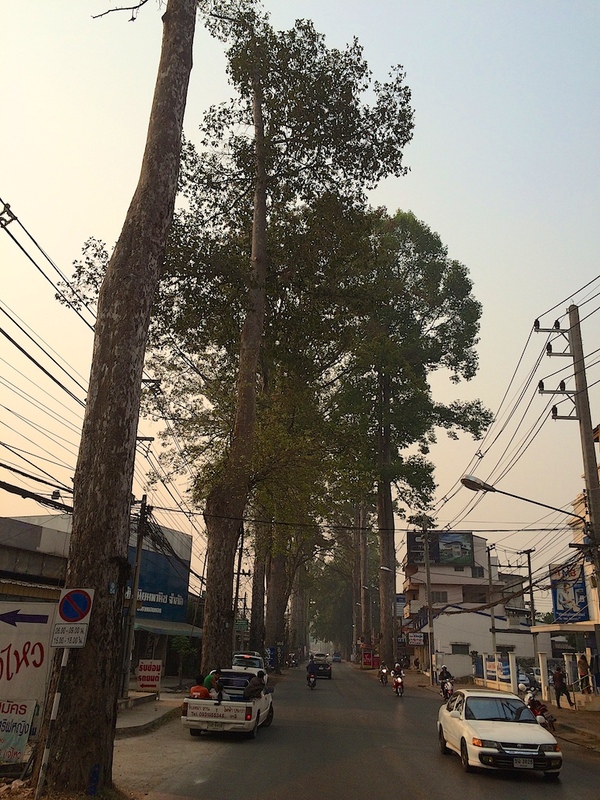 Large trees are worth a lot of money in Thailand and many are chopped down illegally. To dumb it down for me, our guide explained it in simple terms. 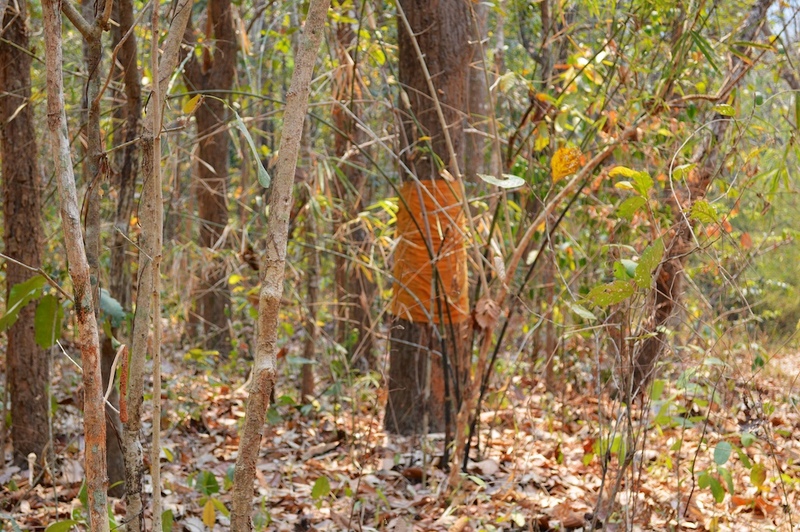 Since Thailand is a predominantly Buddhist country, monks will bless their cloth and wrap it around the trunk of a tree. She stated that to kill a monk would mean bad things to that person on Earth and in the afterlife. Basically the cloth turns the tree into a monk, therefore preventing most from cutting the tree down. Whatever works, right? One final thing I wanted to mention before wrapping this post up (no pun intended). In some of the first photos above you might think they were taken at dusk. They were not. All these photos were shot in the middle of the afternoon. 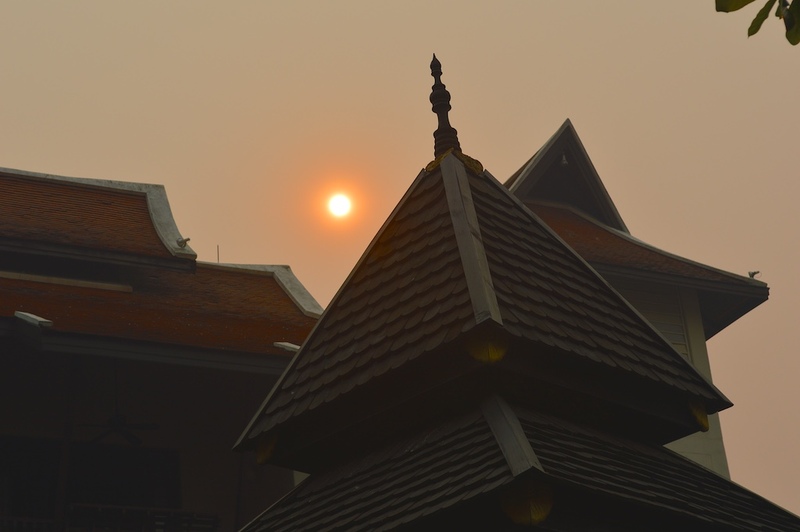 I have since learned that Thailand doesn’t have just two seasons, they actually have three: dry season, wet season and in March, the smokey season. Or what I like to call the “smoge” season. This is the time of year that villagers from Thailand, Myanmar and Laos burn old crops, secondary growth and trash. The “smoge” was so bad that it actually shut down the Chiang Mai International airport while we were there. 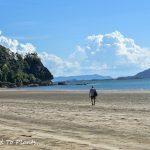 My wife and I had no clue it would be this bad and can only recommend you skip Northern Thailand in March. Well, unless you are from Beijing. Then you will feel right at home.